It is reproduced with its cloves. The larger cloves you plant, the larger the harvest. Separate the cloves immediately before planting. Garlic can grow above 7 °C (45 °C); the optimum temperatures are around 20 °C (68 °F). At least 30 cm (12 in) between rows and 5-10 cm (2-4 in) between plants in a row. Approx. 15 plants per person. Fall: October till January. Spring: February. When the cloves are gaining thickness, they need a lot of moisture. Water 15 cm (6 in) deep, twice a week. Use organic mulch. Strawberries, raspberries, lettuce, tomato, beetroot, carrots, cucumbers, tagetes, Indian cress, calendula, fruit trees. Beans, peas, broad beans, chickpea, soybean. It is not very sensitive. Don’t fertilize with barn manure or nitrogen. Keep the soil soft. Store immediately when a third of the leaves turn yellow. Pull garlic out together with leaves, bind into bunches and dry. Store in a dry place, put in net bags or hang in strings. The cloves and young bulbs. 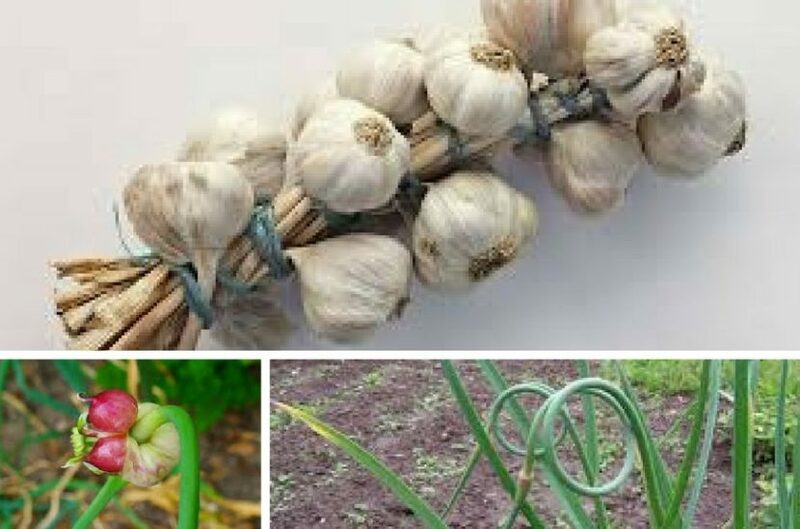 They have many beneficial effects: they work as an antiseptic agent, decrease cholesterol levels and blood pressure, and contain vitamins A, B1, B2 and C.
Garlic growth depends on the length of the day – in short days it develops roots, and leaves in long days. Cut off the flower stem to get a stronger bulb. Garlic is extremely healthy. There are spring and fall/winter types.